As you know, last week's show was rebroadcast from March 15, 2009, since I was in Durango, Colorado, attending second annual Durango Ragtime and Early Jazz Festival. 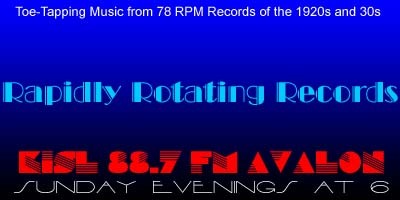 We had a great time and this week's brand new edition of Rapidly Rotating Records gives you a glimpse into the festival. This week's show has only one topic segment, and that has to do with the festival. Each of the records on the show is somehow connected to the festival. Just click on the link below to instantly listen streaming online and/or download the show. Your comments, requests and suggestions for topic suggestions are always welcome. What's your favorite record this week? Enjoy! Stay Out Of The South – Earl Burtnett AHO / The Biltmore Trio, v.
Roll On, Mississippi – Dorsey Brothers Orchestra / The Boswell Sisters, v.
The Cop On The Beat, The Man In The Moon And Me – Victor Arden – Phil Ohman, Duo-Pianists / Frank Luther, v.
Try A Little Tenderness – Charlie Palloy AHO / Charlie Palloy, v.
The Moon Got In My Eyes – Hal Kemp AHO / Bob Allen, v.
Moonstruck – Jimmy Grier AHO / Bing Crosby, v.
Slap That Bass – Ike Ragon AHO / Ike Ragon, v.